Eurosport Asheville: Premier Showing of BDR Mid Atlantic Routes — Wedge Brewing Co. This is the Friday Night kickoff to our ESA ADV Prep Weekend!! Stay through Saturday and enjoy Adventure enthusaist, world traveler, renound motorcyclist, professional starlet, and BMW officiando Shawn Thomas of Adventure Brothers as entertains and educates with a FULL day of TWO wheel classes. and Tim James, BDR Ambassador and MABDR film expedition member. Free admission. $5 raffle for a chance to win dealer supported MABDR tour. Get a free MABDR map when you purchase 4 raffle tickets. Proceeds to support the BDR and the Blue Ridge Parkway Foundation. 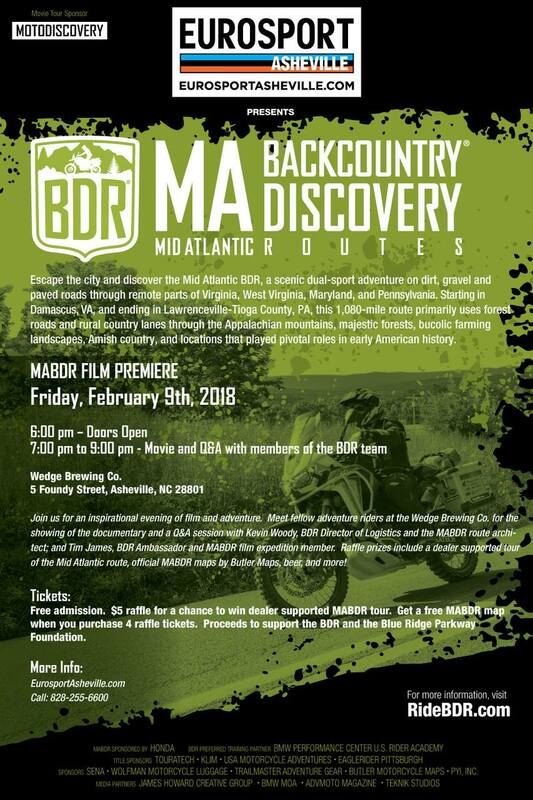 Raffle prizes include a dealer supported tour of the Mid Atlantic route, official MABDR maps by Butler Maps, beer, and more!